It’s still too early to completely cut back healthy perennials. We recommend waiting until the leaves have fallen off the trees to cut most back. (More about this in the coming weeks.) With the exception of roses and plants where seeds, leaves or pods provide winter interest or serve as food for birds, you can continue deadheading to keep plants tidy. It’s suggested you cut back to the ground now perennials that typically exhibit powdery mildew such as tall Phlox, Bee Balm and Peonies (not Tree Peonies). To reduce the spread of the disease, don’t dispose of infected vegetation in your compost pile. Stop pruning all trees, shrubs, and as previously mentioned roses, until they are fully dormant. Pruning encourages new growth and this new growth will not have time to harden off before winter. Also avoid pruning spring flowering shrubs like lilacs, forsythia, viburnum and rhododendron. Spring flowering shrubs have already set their buds and pruning will reduce their spring flower display. Again, the exception to the fall pruning rule is when it is necessary to remove dead or diseased branches. Don’t forget to continue watering, particularly newly installed plants, throughout September and October. Regular watering is essential for plants to complete their cycle and enter dormancy in a healthy state. Consider planting trees and shrubs in your landscape now. Both container-grown and balled and burlapped trees and shrubs do well when planted in September and October. 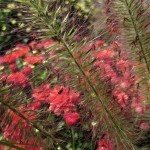 There’s also still time to plant many perennials and have them safely established before winter. Flowering bulbs require little work beyond planting now for a wonderful spring show. Choose daffodil or hyacinth varieties if you are plagued with squirrels, deer or chipmunks. Recommendations vary regarding the ideal time for planting spring bulbs. Traditionally it’s recommended to wait until later in the fall when the ground temperature is about 55 degrees F but some garden experts are now encouraging planting bulbs when the soil temperature are still warmer. This year we decided to conduct our own evaluation in the Landscape Tapestry Garden at the Aurora garden center location. We’ll plant some bulbs in the next week or two, and another similar sample group later in the fall when the soil has cooled and observe their performance in the spring. We’ll share our results with you next spring! With cooler weather on the way there are still plenty of great gardening days remaining. September is the best time to reflect on the passing season and build anticipation for next spring.